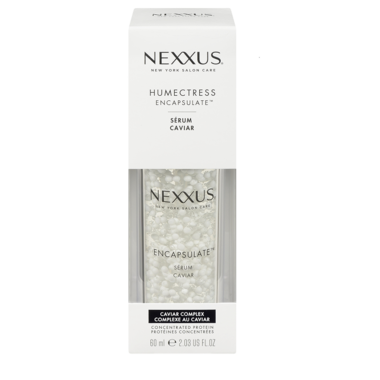 Nexxus created the Humectress Encapsulate Serum as part of the Therappe® Humectress collection. It is a professional hair serum for hair prone to dryness and designed to indulge normal to dry hair with Concentrated Elastin Protein. It boasts innovative concentrated conditioning oil encapsulated into pearls. The result? Responsive hair with beautiful movement. Nexxus Humectress Encapsulate is a professional hair serum for Ultimate Moisture. The pearls are suspended in a water-based rebuilding serum, rich in nutrients and pure protein. Nexxus Encapsulate Serum helps return hair to its pre-damaged feel and should be used as Step 3 in the Therappe Humectress collection. Step 1: Experience the rich lather of Nexxus Therappe Shampoo. Massage from root to tip, then rinse. Step 2: Smooth Nexxus Humectress Conditioner onto wet hair, allow to rest, and rinse thoroughly. Step 3: Press 2-5 pumps of the Nexxus Humectress Encapsulate Serum into your hair for shorter lengths, or 4-8 pumps for longer hair, and lock in weightless moisture. Jheri Redding founded Nexxus New York Salon Care in 1979. Redding believed that protein could replenish hair, giving it renewed health and beauty. Since 1979, hair care has progressed but the remarkable power of protein remains at the core of all Nexxus hair products and hair care regimens. The custom-crafted formula of the salon hair products in the Therappe Humectress Collection is enriched with Concentrated Elastin Protein, and leaves dry hair deeply nourished, responsive and replenished with natural movement.